Roasted veggies are a favorite in our house. The kids love roasted broccoli and carrots. 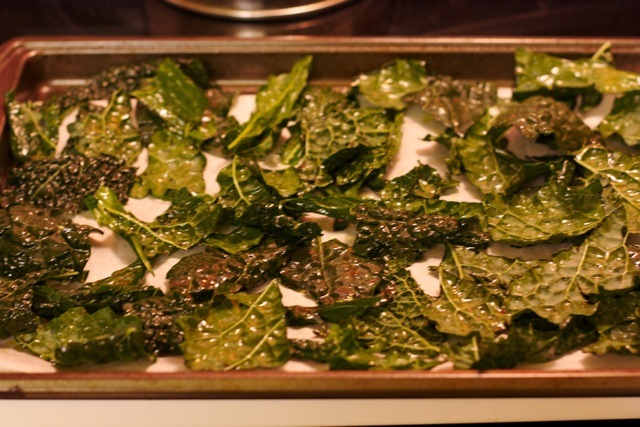 We were turned onto kale chips by a neighbor, and we’ve made a few batches and they disappear as fast as they come out of the oven! They are really easy to make too. Preheat the oven to 375. Tear the kale into pieces, removing the ribs. Toss with olive oil. Add a sprinkle of salt if desired. Bake until crisp, 15-20 minutes. They cool quickly and are best still slightly warm.